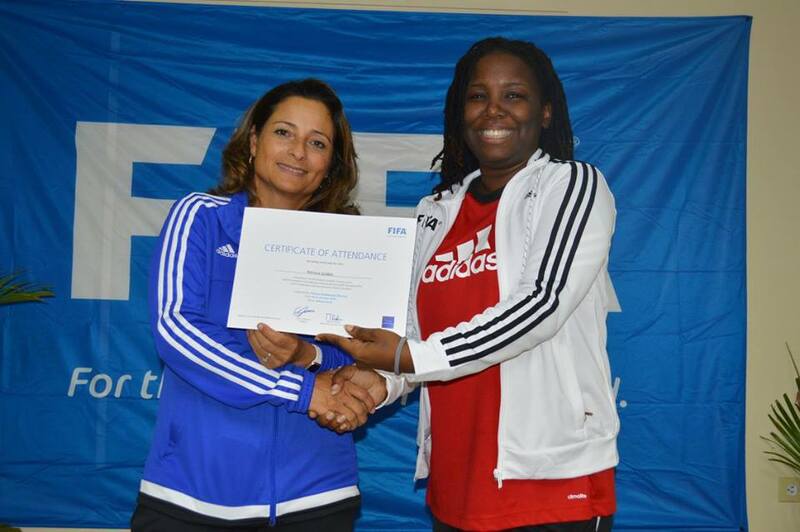 Discover Montserrat Editor Nerissa Golden receives her certificate for completing the FIFA Grassroots Coaching Course from Facilitator Andrea Rodebaugh-Huitron. 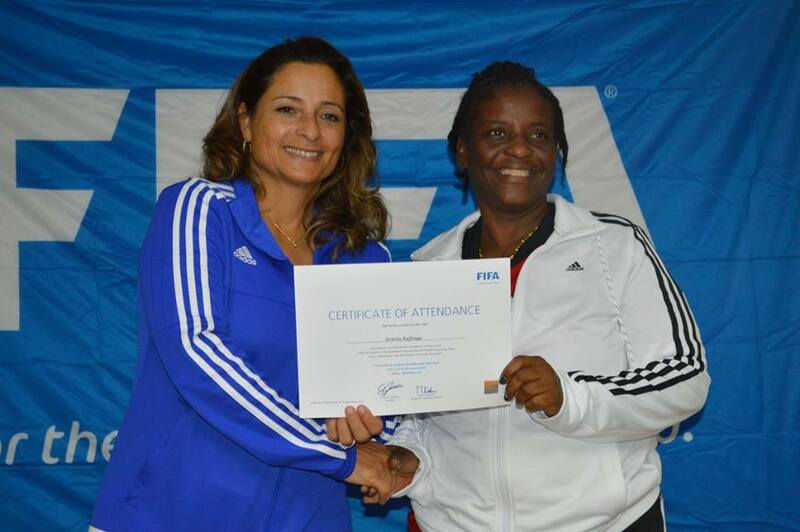 Salem Nursery teacher Arietta Buffonge receives her certificate for completing the FIFA Grassroots Coaching Course from Facilitator Andrea Rodebaugh-Huitron. Some of the grassroots children enjoy a fun game called the World Cup. More than 25 men and women completed a five-day intensive course to become grassroots football coaches. 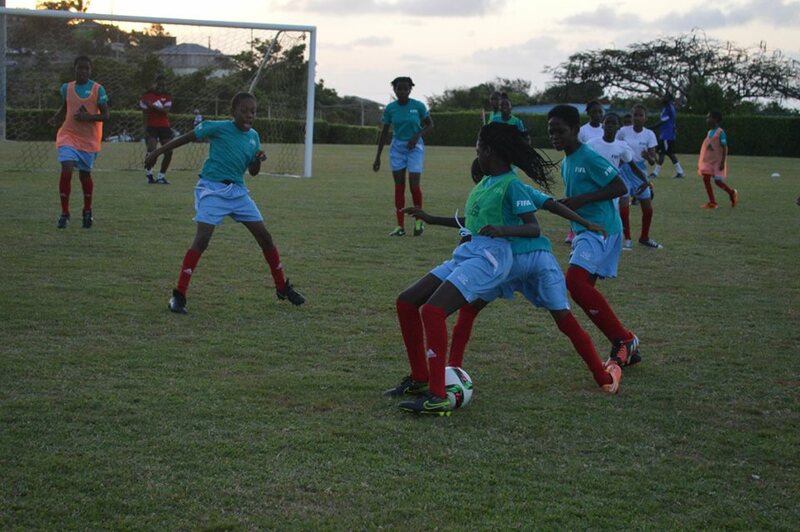 The course, sponsored by FIFA through the Montserrat Football Association (MFA) is an effort to increase the number of support staff available to organise grassroot games especially for girls. FIFA has mandated that more investment is to be made in getting girls and women into the game. According to FIFA, there are more than 250 million people across the world who play the sport and of that only 30 million are women and girls. Vice President of MFA Ottley Laborde congratulated the participants on completing the course and said he hoped that in the future some of them will be able to go further as coaches and receive additional training abroad. The new coaches were presented with certificates on Friday, June 24, 2016. Over the five days, they learned about the differences in how boys and girls approach the game, designing games to achieve technical goals while having fun. On Saturday morning they will be organising the annual Girls Grassroots Football Festival, scheduled to begin at 10AM at Blakes’ Football Field.